$ 1.99 per sq. ft. If you are looking for a great place to buy carpet and feel confident in that carpet purchase and installation, come visit us at any one of our 12 Front Range locations. Carpet Mill Outlet Stores has locations in Arvada, Aurora, Evergreen, Fort Collins, Highlands Ranch, Lakewood, Littleton, and Thornton. Each of our locations offers carpet installation which our staff handles efficiently and effectively. Focus on the right carpet option for you, and let our team handle the installation side of things. Let our knowledgeable carpet sales professionals guide you in selecting the perfect home carpet or commercial carpet for your unique style and budget. We offer very low carpet prices, quality carpet cushion and of course, convenient carpet installation. Follow us weekly on Facebook for our carpet sale promotions, giveaways and tips on selecting, cleaning and other handy carpeting information. 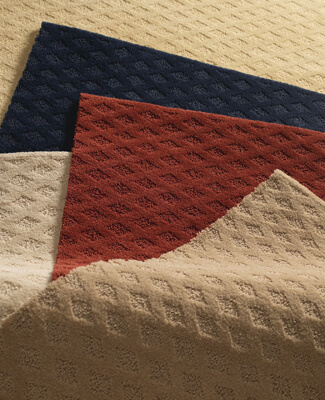 Ready to shop for new carpeting? So much lies ahead, let us guide you through the process of finding and purchasing new carpet. The better you understand what you like and what your room needs, the better your flooring selection will be. Carpet can offer more versatility, comfort, ease of maintenance and health benefits than other flooring options. It is more “budget-friendly” than most other choices and there are styles to coordinate with every décor. only insulates floors but also provides a psychological feeling of warmth. Slip-and-fall accidents are more likely to occur on hard surface floors, instead of carpeted floors. Carpeting is less labor intensive to clean and maintain than hard surface flooring. The demand for green flooring is growing. Textures, different types of yarn systems, different colorations, patterns, tone-on-tone prints, looped carpet, tip shears anything that has interest in fashion seems to be popular. Bold floral patterns are back. Bold geometric pattern carpets are becoming favorable of many householders. Handmade rugs are also becoming popular. This carpet buying guide covers everything you need to consider when shopping for carpet without a sales pitch. The better you understand what you like and what your room needs, the better your flooring selection will be. • How do you use the room most? • What types of activities are common in this room? • What are the room’s lighting sources? • Does the room flow into others or stand alone? • How do you want to feel when you’re in this room? • What’s the style of the room? Traditional? Contemporary? Rustic? • What’s the feel of the room? Casual? or Formal? Somewhere in between? • Will people have food in this room? • Will kids play in this room? • Will kids play with their food in this room? • Does the room directly open up to the outside? • Is your new flooring purchase motivated by style or practical reasons? • What’s the first thing you want to notice when you enter the room? The better prepared you are to answer these questions, the easier it will be to select the best flooring for your home. Carpet cushion or padding is a critical flooring component. It provides the foundation for your carpet, responsible for enhancing both comfort and durability. Padding is constructed of several different materials, including sponge rubber, foam rubber, urethane foam, bonded urethane and felted combinations of hair and jute. Always follow manufacturers’ recommendations for cushion weight, density, and thickness. No other flooring warms and insulates a room like carpet. The warm comfort that carpet provides is not just your imagination. Unlike other types of flooring, carpet is a natural insulator, providing additional warmth in cold seasons. The use of carpet in a wall-to-wall application actually increases the R-value, or insulation level, of the carpet area, potentially saving homeowners like you utility costs while reducing energy use. The R-value (thermal resistance) measures how much a material resists the movement of heat through a ceiling, wall, or floor in a building. The higher the number, the more effective the insulation. Start your search for new carpet with Carpet Mill Outlet Stores. While we appreciate the consideration of the above, our professional team is equipped to help you answer these questions to make buying and the installation of your flooring easy. Our staff is knowledgeable and experienced with a variety of flooring installations which makes this process worry-free for you. We know finishing or re-designing a room can be stressful which is why we’re here to help. Allow us to help bring your dream room to life with low prices and quality carpet installation. Carpet Mill Outlet Stores have locations in Arvada, Aurora, Evergreen, Fort Collins, Highlands Ranch, Lakewood, Littleton, and Thornton, all of which can handle any flooring or carpet installation. Call our stores today to speak with a team member about purchasing and installing your new flooring or carpet!